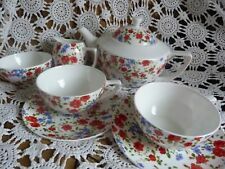 Beautiful U n Used Whittard of Chelsea Tea Clipper Dessert/Breakfast/Soup Bowl. Whittards of Chelsea: 4 red pattern bowls, used, very good. Free postage.